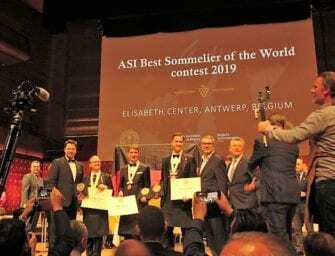 Following on from my 5th March over-view post about Simplesmente Vinho – its aims and trends – this post reports on the highlights from my visits in the days leading up to the two-day wine fair in Oporto. I explore how the trends I flagged are playing out in the glass and take a peek into the future with some work in progress wines. Visting Vinho Verde, it was good to spend time with Márcio Lopes, whose Pequenos Rebentos Vinho Verde and Douro wines were one of last year’s exciting discoveries. Having worked for Anselmo Mendes, his Vinho Verdes are, for me, the stand out of his range; they are now being imported into the UK by Indigo Wines. We kicked off with my introduction to the 2017 vintage which, he reckons, made the region’s producers very happy. 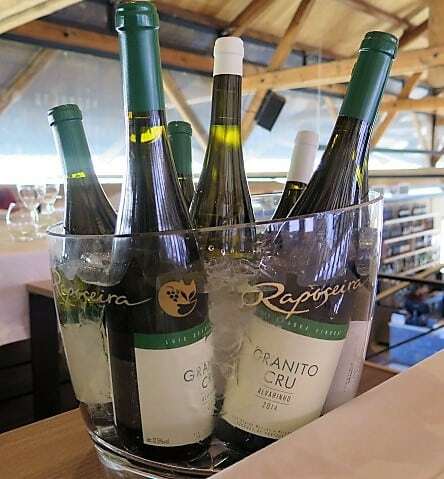 As I noticed during November’s visit to the Dão, despite the drought and heat, whites have great fruit intensity and juiciness – with ripe but abundant acidity. 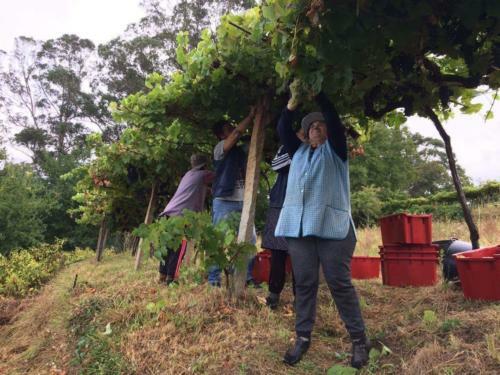 Pequenos Rebentos Loureiro Escolha 2017 is a lovely example of the variety with nice concentration and interest, elevating it above the floral/soapy and short examples which point to all too common high yields. 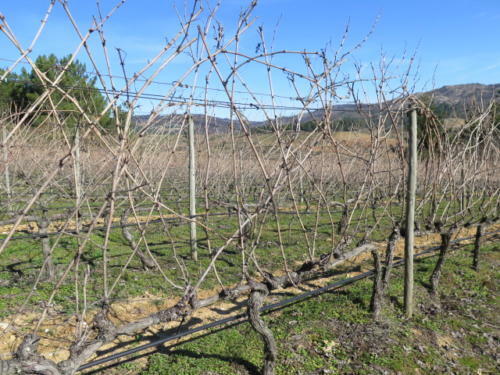 Visiting two Loureiro vineyards, Lopes impressed on me the importance of finding low vigour vines, even within a single vineyard where a selection massale plantings yields different results. At last year’s fair I enjoyed his Pequenos Rebentos Alvarinho “À Moda Antiga” (Monção e Melgaço, Vinho Verde) which is foot trodden and aged in old oak. A barrel sample from 2017 was powerfully intense, complex and spicy with a ripe but (attractively) bitter citrus note and saltiness, which I reckon is accentuated by skin contact. Great potential. 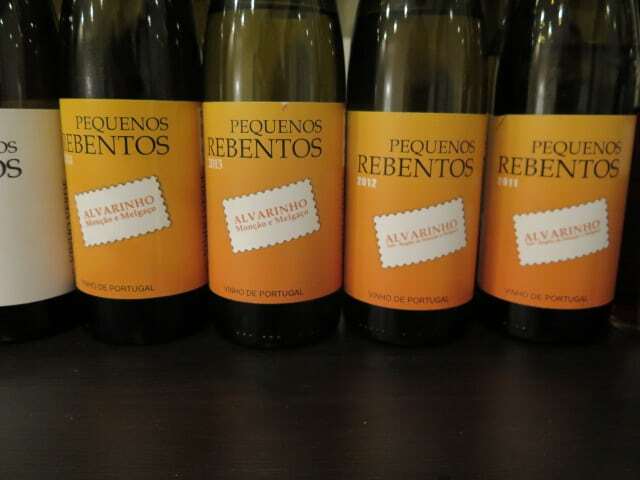 As for the regular Pequenos Rebentos Alvarinho, an oversight resulted in the 2017 undergoing a particularly cool ferment, so it teeters into ripe NZ Sauvignon territory, with lashings of pink grapefruit, guava and passionfruit. Not Lopes’ usual style, but it is a great example of that style and has sold out! A vertical showed off the variety’s/Monção e Melgaço sub-region’s more classic honeysuckle, citrus and stone fruits – the 2015 and 2011 were very good indeed. Every year, Lopes likes to try new things and two of this year’s innovations – both cask samples – snagged my attention. Pequenos Rebentos 2017 Vinhas Velhas Loureiro (12%) is a selection from older, lower vigour vines which he made without temperature control or racking and with a little skin contact, in old “very soft wood” barrels he bought from Puligny Montrachet. It has great citrus (ripe) limey drive and minerality with snappy, animating acidity and a touch of talc on a long, long finish. Pequenos Rebentos Selvagem [meaning wild] 2017 comes from a 92 year old vinha de enforcado (high trained vineyard, pictured) planted to Azal, a grape which Lopes describes as “very rustic.” Picked by ladder, this is the oldest style of ‘trellising’ in the region, which you can still find around the edge of fields (it allowed farmers to grow corn/graze livestock in the field). It’s a vigorous, quantity-focused system, so Lopes removed lots of leaves and bunches to improve ripening and concentration. Even when picked, the grapes were green. He de-stemmed by hand to avoid glycation and green tannins, before fermenting the wine on skins for 30 days. It was then pressed, spent 90 days in amphora and completed its elevage in old French barrel. Thanks to ageing in oak, it has a certain poise – depth and focus – which I like very much, so this Azal is not so rustic! Vanillin oak nuances deftly balance the trace of bitterness, which I suspect is a function of skin contact; detecting a slight ashiness to the finish, I was reminded of Kerri Thomson’s comments about Riesling and skin contact. At its core is a lovely clarity, profundity even, of the green applely fruit I associate with this variety, albeit my experience of 100% Azal is limited. So the palate has weight and flesh – holds it ‘ground’ – but a sappy freshness too. With complexing apple blossom and a subtle earthiness, it is very promising! When I visited Galicia in 2016 and 2017, I was struck by how much more finesse the Spanish are coaxing out of their red grapes for light but intense, aromatic reds. Lopes is working on it and Pequenos Rebentos Tinto 2017 shows promise. 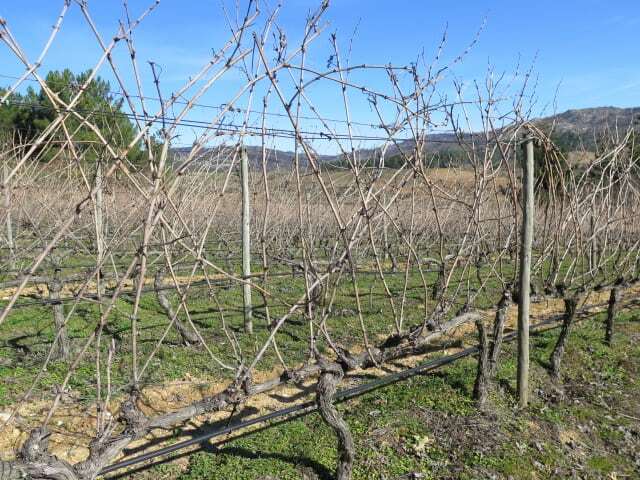 It’s a vinha ramada (pergola-trained, pictured) field blend of Cainho, Alvarelhão and Pedral. This traditional training system was also focused around quantity, not quality, but Lopes has produced a pale but aromatic (rose petals) and intense, creamy even, red which just spent one day fermenting on skins (Cainho and Pedral have lots of colour in skins). It completed the fermentation in old barrels. Slowly but surely (doubtless the lightness of being shift helps), Vinho Verde/Minho is starting to simmer when it comes to interesting reds. The next day I met with Tiago Sampaio of Folias de Baco, who established Douro label, Olho no Pe, in 2007 following completion of his phd in Oregon (latest wines go under the Uivo brand). Sampaio fell in love with Pinot Noir in Oregon, planting a multi-clonal selection in the Douro in 2001. His enjoyment of its acidity and delicacy have surely influenced how he approaches Douro harvest dates and vinification (very gentle extraction). An approach which makes sense given his vineyards are located at around 500m in Favaois (the traditional home of Moscatel). 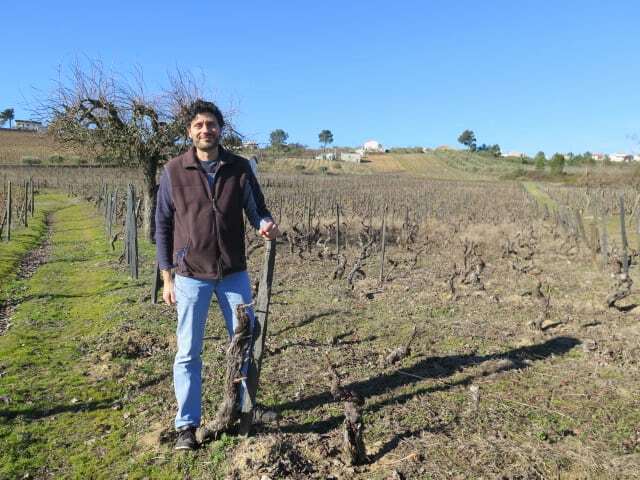 The open-minded vigneron, who started agricultural school at aged 13, has taken both vineyards and wines in directions which his grandparents would have found unimaginable. Since the local co-operative was established in the 1960s, they had sold it their grapes. In the cellar 2017, Sampaio gave us a sneak peek at the 2017 vintage – his earliest to date. It started on 8 August! The whites – a Rabigato (a very much on trend single varietal white), Alvarinho and Moscatel Galego are super-fresh and vividly etched. The Rabigato is very characterful, with a salty, earthy note and firm grapefruit and greengage skin bite. Like Jorge Moreira’s Poeira White, Sampaio’s Alvarinho is leaner and meaner than anything from Vinho Verde – taut and mineral with pretty nectarine skin aromatics. The Moscatel is dry with defined aromatics (so very not blousy), a cool hint of peppermint and some of the earth/bloom gentle phenolics I found in the Rabigato. Dusky pink Uivo Renegado Tinto 2017 (50:50 red and white field blend grapes, 12% abv) is a little cloudy in 2017 with a touch of glycerol, which softens it a little around the edges, though it’s mineral to the core, with steely, grapefruity acidity and a touch of earthiness (mineral, nothing unclean here). The 2017 Pinot Noir looks very promising, with lacy, fine tannins, lifted spice and juicy cherry and berry fruit, while an old field blend red is beautifully fresh, floral and taut with minerals. Like Lopes, Sampaio loves to experiment. We tasted wines aged in chesnut barrels as well as oak (currently showing blockier tannins, I thought) and a couple of crazy whites to excite. 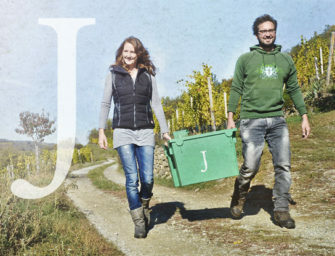 A Jura-like 2012 comes from a 500l tank from a harder press which had developed flor. Sampaio thought about selling it in bulk, but then decided to let the flor grow (he has never topped up the tank). Yellow in hue it has an aldehydic nose and palate, with fresh cut apples and satin brown, nutty apple pips. Quite fino-sherry-like. Another accident has produced a wine which is heavily reminiscent of a Dry White Port, but drier and without the alcohol (spirit). This accident occured in 2009 – a hot vintage. Sampaio simply forgot about a barrel which was very high in alcohol (16%). It is golden yellow and spicy with those satin brown, nutty apple pip notes on a bone dry palate, a touch aldehydic. Sampaio is thinking to blend it with the flor barrel. I look forward to tasting the results. Last, Sampaio has made his first Vintage Port (indeed, Port) for commercial release in 2017. True to his style and, I should add, his terroir, it is very juicy and fresh (with succulent black berry and cherry) and relatively dry. It was fermented on 100% stems and, with just 50g/l residual sugar, it is markedly drier than typical vintage Port (where the residual is double that, plus). It put me more in mind of, say, Filipa Pato’s fortified Baga, which is all about freshness (though there Atlantic influence holds the key). Sampaio progressively added the brandy for progressive extraction and integration of spirit. Promising and very different. Over a busy lunch service at Cêpa Torta in Alijó, the restaurant where acclaimed chef Rui Paula kicked off his career, I caught up with Sampaio’s current releases. Uivo Vinhas Velhas Branco 2016 has an unexpected roundness and ripeness following on from the barrel tastings. But it is textural and mineral, sitting in the mouth, it has a pleasing presence like a pebble – round but cool and self-possessed. Quinta do Infantado are also gunning for a drier style of Port. I cannot recall ever having seen the phrase Meio Seco (meaning medium dry) on a Ruby Port before. Or encountering an unfiltered Ruby – even if it is a Reserva! Quinta do Infantado Meio Seco Ruby Reserva Port is a true Christmas cracker – or make that any time of year, for this is a slim Jim! It has just 50g/l residual sugar and, like Saimpo’s Vintage Port, was progressively fortified (as opposed to the brandy spirit being added at a single point in time, which is typical). It reveals eucalypt-edged juicy blackberry, black currant and plum fruit with liquorice and anise spice. 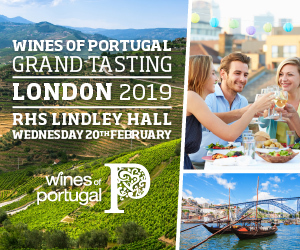 It has flesh and is fresh with impressive substance and nuance for this category As João Roseira points out, if you make a drier Port you add less brandy, so it is a lighter style as well as drier style. One which, he adds “makes Port easier to put at the table.” I’m all for it based on this evidence! 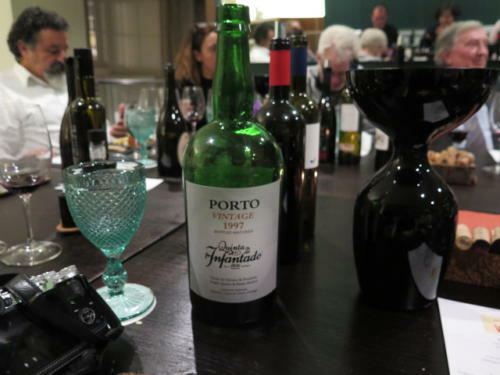 As for Quinta do Infantado Vintage Port, the 2014 and 2015 tasted during the visit (and a magnum of 1997 enjoyed at Simplesmente Vinho’s welcome dinner) shared an elegance, showing notable fruit purity, freshness and litheness. Expanding on his earlier comments, Roseira explained, “we believe in less sugar, we add wine brandy several times; 20-25% early on in the ferment so it integrates.” The Ports end up at 19% abv. The 2014 was snatched from the jaw’s of hell in a year which Roseira described as “a total disaster for us, the worst since 1993.” And he does not exaggerate. 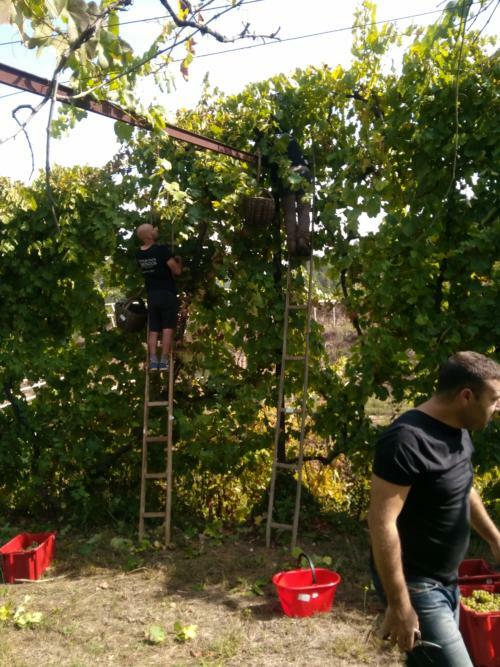 It rained, he said, on the first and last day of harvest and they threw away 20t of grapes and sold every drop of wine they did in bulk. Right there’s a commitment to quality. 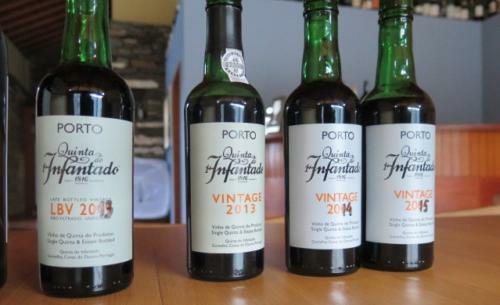 The super-duper-selection (5,000l) which went into the Quinta do Infantado Vintage Port 2014 produced a dark, inky but accessible, elegant Port with floral and bergamot perfume, fine tannins and juicy, rolling acidity to its animated blackberry and cherry fruit. 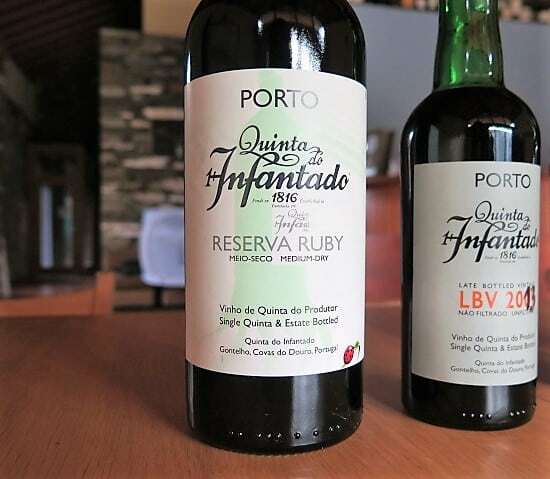 Quinta do Infantado Vintage Port 2015 is, as I expect of this vintage, floral – richer, plusher florals here – think heady, thick, damask rose petals. The palate is fresh and precise if a little bit closed now, with fine, papery tannins and a eucalypt edge to its blackberry fruit. The impressive Quinta do Infantado Vintage Port 1997 was still choc-ful of blackberry and plum fruit but, with good juice and flow and ripe but fine supporting tannins, it retained elegance. Lovely. (Incidentally, when Álvaro Martinho Lopes picked me up the next day from the Gontelho valley where Infantado are based, the viticulturist described the Gontelho as one of three valleys which produce the creme de la creme of Port, together with the Torto and Roncão valleys. Why? Because with low, hot and dry vineyards with very friable schist, roots can go down 10-15m, producing grapes rich in sugar, nutrients, tannins and density and vines which are very long-lived). Most Portuguese will know Pedro Garcias for his work as a journalist at the national daily newspaper Publico. Latterly as a wine writer but, he told me, covering everything over his 20 year career. Through Mapa, his wine, he has navigated a course back to his family’s roots in the Douro. First buying vineyards in Muxagata (Douro Superior) then, in 2015, in Favaios, Alijó (Cima Corgo, at 600m), from where his family hail. 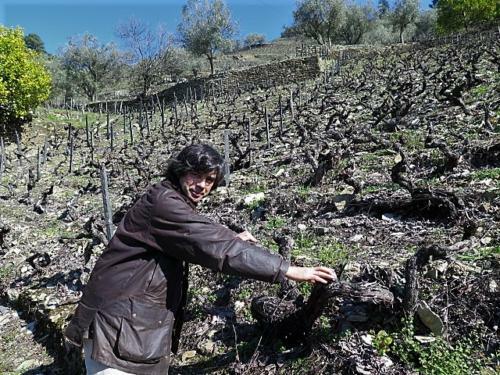 (Incidentally, the Alijó vineyard was acquired from chef Rui Paula’s parents). 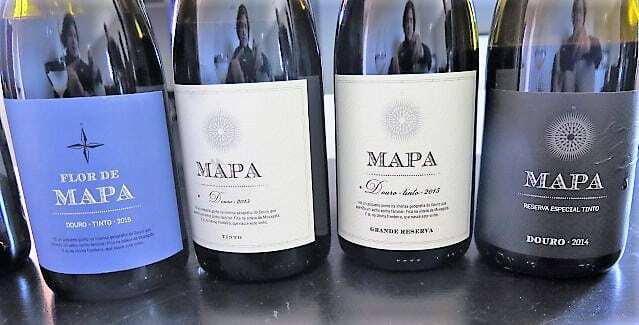 I came across Mapa a few years ago and was impressed by Mapa Branco 2012 (reviewed here). 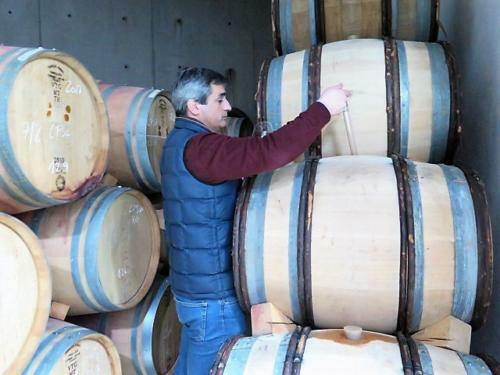 Since the first wine in 2009, Garcias’ range has burgeoned from 3000 bottles to 35,000 bottles; Garcias is already extending the small but neatly designed winery to create a new barrel cellar. So it was good to visit and find out more. We tasted 2017s from tank and barrel. Though he is (rightly) pleased with the acidity (all natural) and tannin ripeness, this hot dry vintage was logistically challenging because everything was ready early and all at once. Garcias reckons 2017 points to the future, so it is a good thing he is creating more space. Different barrel samples of the Muxagata Rabigato whites impressed – one rich, spicy and limey, the other very taut and racy with lime zest and grapefruit. Planted higher and on particularly calcareous schist, the freshness and persistence of both is marked. For Garcias, the two will make for a balanced final wine. Water white, a Moscatel Galego tank sample is very perfumed but fresh and dry, with rose petals, a hint of pear and saline finish. A fresh but savoury, textural Alijó Tinta Cão rosé represents a different path from the more common, fruitier Touriga Nacional or Touriga Franca examples. Already bottled is Mapa Maoa dos Altes 2017– a new wine from another even higher, abandoned vineyard in his mum’s village, right on the edge of the Douro. Explaining he came from a poor family, where only the women worked on the home farms (his father was a builder), this wine is about “continuing the memories of my mother on the farm,” says Garcias. Granite soils and 700m of elevation makes for a very drinkable red, which is the jewel-red colour of pomegranate, with some of its crunchy red fruit and pithiness (of tannin) to the palate. It has a touch of catering chocolate to the finish. A quality which, for reasons unknown, I often find (and like) in lighter reds. Garcias’ 20 year old Alijó Tinta Cão red gets more of a work out (than the rosé) in Mapa Tinta Cão 2015. Foot-trodden, it’s a deep colour, with a powerful nose and palate of vine fruits, with dried honey/membrillo and balsamic notes and a dense fretwork of tannins. True to its place of origin, a fresh, mineral undertow of acidity bodes well for future cellaring and cellar well it does based on a 1980s’ example from Duas Quintas which Joao Nicolau de Almeida showed me a couple of years ago. Promising. In contrastingly elegant shape already is Mapa Vinha Christina 2014, which is named after Garcias’ wife. It is a blend of Alijó and Muxagata grapes and different fermentations – part is fermented in lagares, another part in tank. It’s my pick of Garcias’ reds – very complete with a succulent core of very pure black cherry, a schistous undertow of minerality, with gently textural, sooty, cool tannins. Lovely. The reds from Muxagata are inevitably bigger framed, which means punters get plenty of bang for buck with his entry level Flor de Mapa Douro Tinto 2015; I found Mapa Tinto Grande Reserva 2015 a little overripe for my taste but Mapa Reserva Especial Tinto 2014, though dark and brooding, has freshness and intensity. Over lunch, Garcias produced Mapa Moscatel Galego Natural 2016, which has no added sulphur. It underwent three days of skin contact with foot-treading in lagares before completing fermentation (including malo) on lees in 500l seasoned oak barrels. 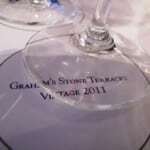 It is quite stony and round, a little applely – firmer and notably less racy than the tank sample. Nice and pure though, with some presence. For Garcias, the idea was to see if it was possible not to add sulphur given Moscatel from Alijó helpfully has a very low pH. Job done. 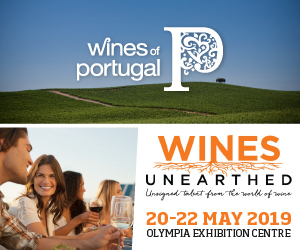 I preferred the unoaked Mapa Douro Branco 2016 to the creamier, rounder, oak-spiced Mapa Vinhas dos Pais Branco 2015, which is aged on lees with batonnage in second use oak. They are both from Muxagata and comprise Rabigato, Viosinho, Arinto and Gouveio blends with 12.5% abv, but the former is salty, very lively, with fresh cut apples; it is sourced from younger 10-15 vines. 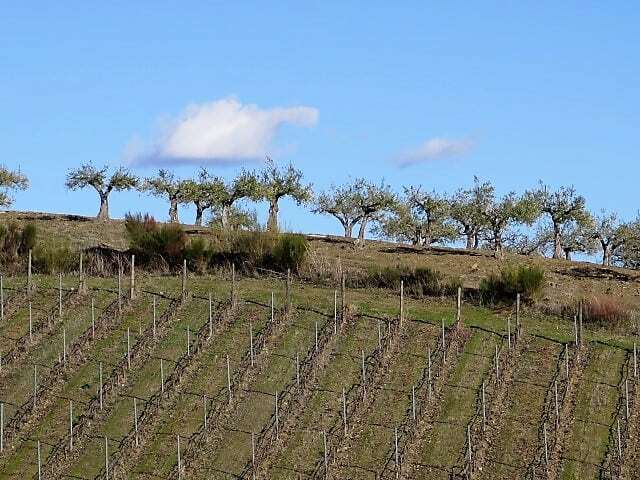 While his Douro whites, especially the dry (and unsulphured) Moscatel represent new directions for the Douro, Garcias has not entirely abandoned tradition. He started making Moscatel do Douro and Vintage Port in 2015 (and also made a Late Harvest wine that year). 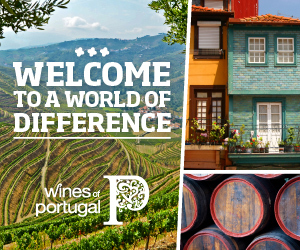 When you drive to Quinta de Vale de Pios, it feels as if you are driving to ends of the earth. Well, okay, Spain! 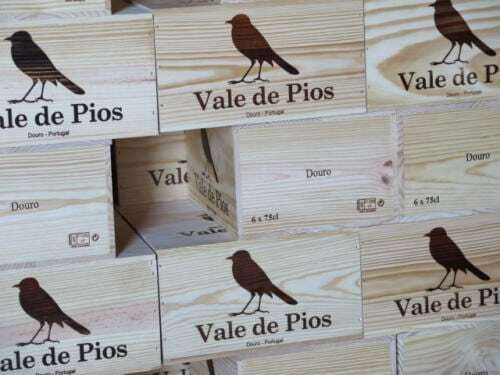 It is located in a remote, unspoiled valley, which doubtless explains its name – Vale de Pios means valley of birdsong. The arid landscape around Barca d’Alva, which is on the south side of the Douro river, bordering Spain, reflects the dry climate. 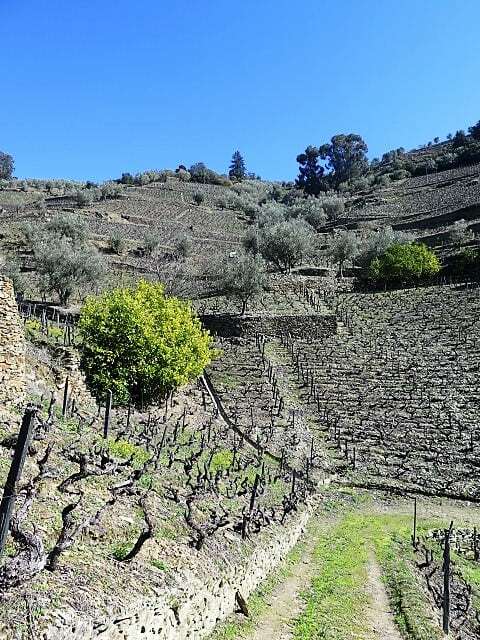 But, as one might expect from an architect – especially one whose clients included wine producers – Joaquim Almeida had diligently researched where to plant his 12ha vineyard. It was one of the first new plantations around this stretch of the Douro river, he proudly reports. Apparently, lots of vineyards existed before the phylloxera devastation but, afterwards, olive and almond trees took hold. He still has 20ha of aged olive trees and a sprinkling of almond trees. 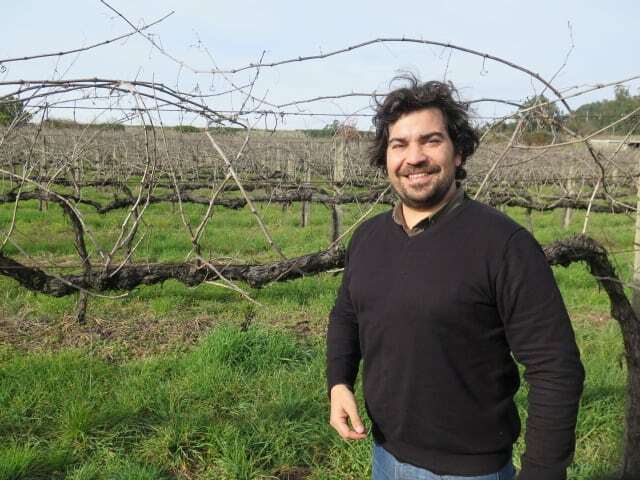 Almeida’s goal was both “to do something like Port in a still wine” and to make natural wines, so finding a dry place was all part of the plan. Rainfall is typically just 300mm/year which, if climate change continues to pose challenges as Garcias predicts, could be augmented in future by irrigation at the beginning of the growing season – “to re-create winter,” suggest the architect. 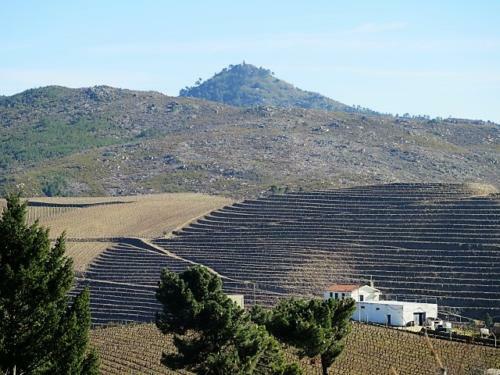 Mitigating the heat which comes with such dryness, is a hill which lies between the Douro river and Vale de Pios, which is situated at 200m. It accounts for Vale de Pios’ very pronounced diurnal temperature variation, for which I can personally vouch. 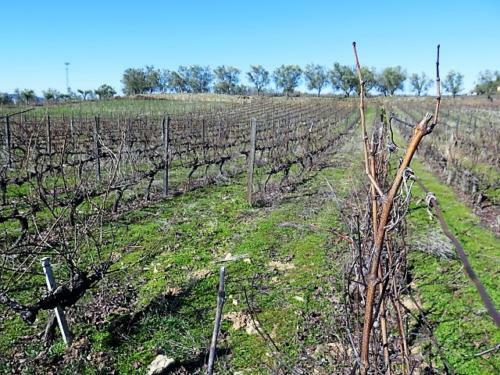 According to Almeida, if it hits 40 degrees in the daytime, night time temperatures might tumble to just 15 degrees, giving the vines some respite. Walking around the certified organic estate, which is broadly split into two parcels, Almeida has also trained the vines lower to direct the energy into the fruit, not the canopy – at 1.4m, not 1.6m to reduce leaves, leaves being solar panels. The rows are planted vertically, which not only helps reduce soil erosion, but also makes it easier to cultivate the vineyard organically (because you can work on both sides of the row). 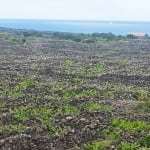 Soils are brown (older, oxidised) Cambrian schist with a high pH, which aids mineral and nutrient uptake. 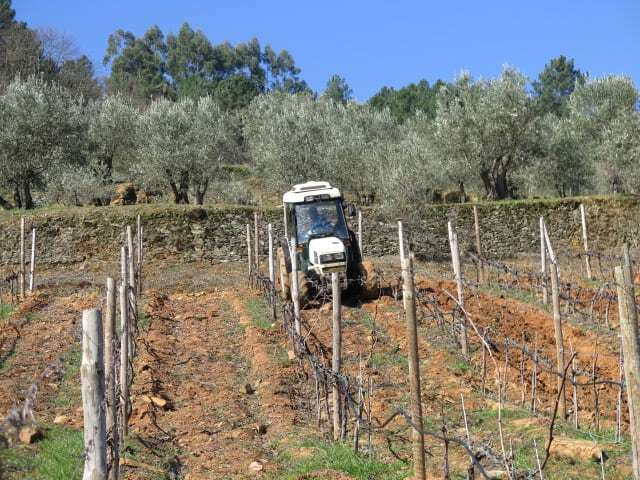 Almeida has planted Tinta Roriz and Tinta Cão on the poorest, stonier soils, Touriga Franca on richer soils and Touriga Nacional in the most shaded areas (one parcel is a hill, with different aspects). 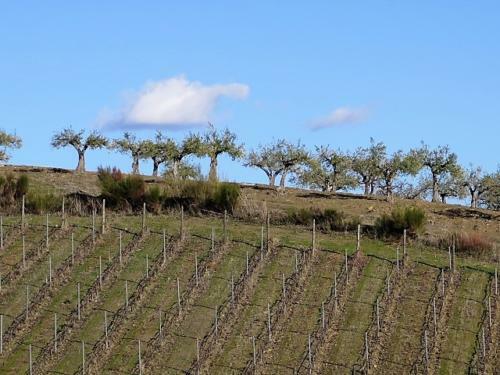 Given the lower, more easterly location and his desire to “to do something like Port in a still wine,” Almeida’s wines have a very different profile to Garcias’ Mapa Douro Superior reds from Muxagata. They show a riper, spicier flavour profile and, also in tune with Port, a mellow sweetness, sometimes jamminess even, to the fruit (which is also a function of bottle age). With trees and bushes around, the fruit is balanced by complexing and characterful underbrush and esteva (‘garrigues’) notes and ripe but structured tannins. So the wines have a certain rusticity, which is not to say they are crude. Rather they evoke their place of origin authentically with an intensity and certain vigor – a channelling of heat, dust and rocks. Entry-level red Vale de Pios Excomungado 2013 (13% abv) references the fact that this wine is unoaked. This is the current release and the 2014 is due to be released soon, which points to Almeida’s preferred mellow style. It shows smooth, ripe fruit with jammy raspberry and dried fig, fruit spice (liquorice, clove hints) and esteva. It is a blend of Tinta Roriz, Tinta Cão, Touriga Franca and Touriga Nacional. Vale de Pios PIOS 2014 shows greater concentration and structure to the fruit – dark berries and jammy red fruits, with esteva notes. 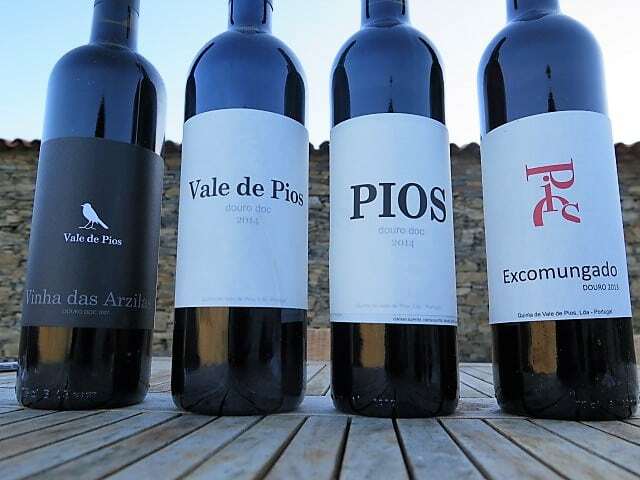 Vale de Pios Vale de Pios [so good they say it twice] 2014 has a higher proportion of Touriga Nacional and, having been foot-trodden in lagares, spends more time in barriques. With brighter, fresher fruit, it is as if the oak has polished the wine. It shows juicy blackberry, underbrush and fruit spice. Nice character and persistence. Vale de Pios Vinha das Arzilas 2007 really runs with the Port approach. It was aged for two years in oak barrel then bottle aged for 10 years, so is coming up for release. It has a tertiary sweetness and mellowness to nose and palate but structurally, it holds up very well, showing the freshness of this mild year. It has pronounced esteva notes and spice with balsamic hints to its intense blackcurrant and blackcurrant jam fruit; dried plum too. 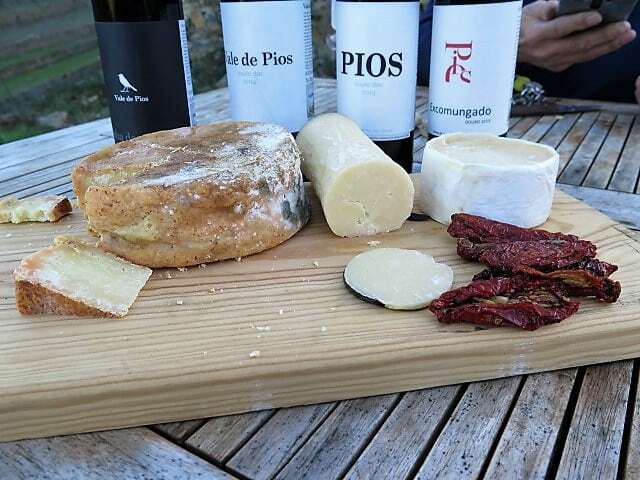 Mellow, yet with a freshness and structure and those characterful esteva notes which you see across the range – even with the sheep’s cheese (left), which is made by shepherd who grazes his flock on the property. Within the sub-regional scheme of things, Lopes’ Douro wines come from the opposite end of the spectrum – the Baixo Corgo in the west. More specifically, Sta Marta valley, which is home to one of the Baixo Corgo’s best known players, Alves de Sousa/Quinta da Gaivosa. 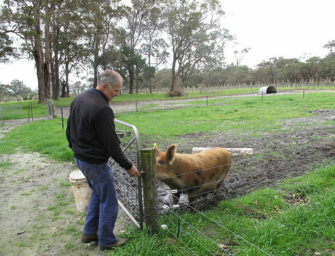 Cooler and wetter, he weighed in on the climate change debate telling me that hotter, drier areas may not have a chance in 50 years, given quality wines need a long growing cycle. 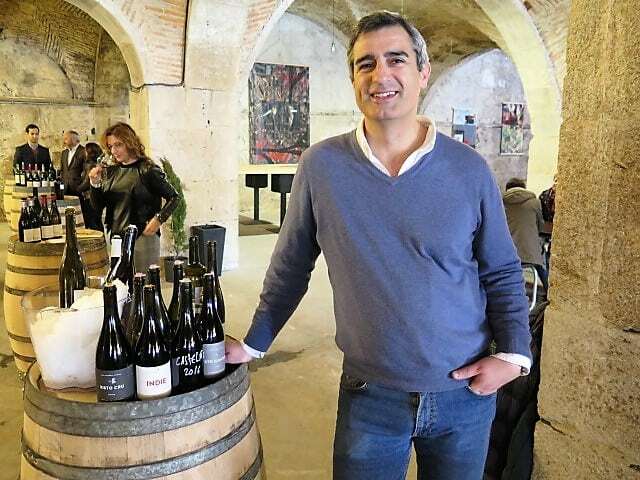 The exuberant producer’s full-time job is Chief Viticulturist at Real Companhia Velha, which probably explains why Jorge Moreira (Chief Wine maker there) consults on one of his wines. 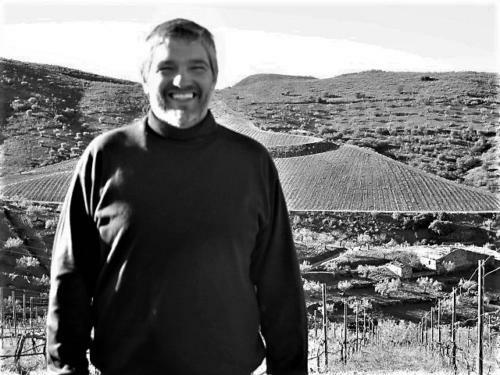 His outspoken opinions explain why Niepoort make another – Dirk Niepoort likes a challenge but, more to the point, is a curious fellow who was intrigued by Lopes’ take on Douro wine. The viticulturist turned winemaker picked me up from Chanceleiros where I was staying (here, very good). He was brought up in the area and, as we drove up into the Gontelho valley, reminisced about absorbing nature by osmosis as he played in the surrounding countryside, learning about the plants and birds whose nests he and his pals counted, seeing who could find most. The rhapsodic account set the tone for an infectious visit with a true Douro passionista! 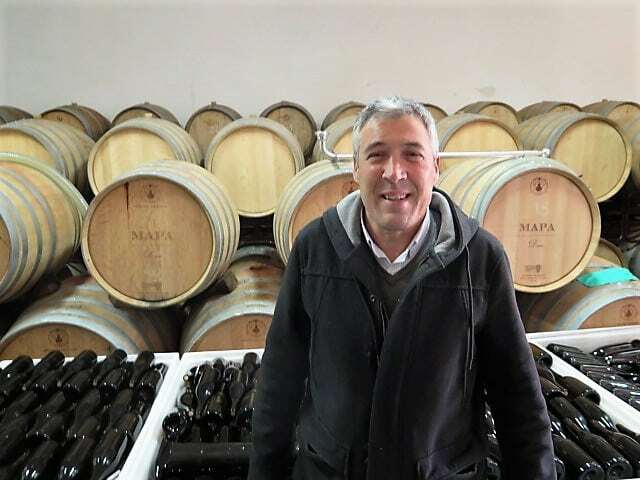 He is the only one of seven siblings to stay in the Douro and has progressively acquired vineyards around his home in Cumeira in the Santa Marta Valley and down near the Corgo river. Mafarrico Branco 2016 comes from old field blend vineyards that we visited. It’s a pretty straight forward, unoaked wine with volume and freshness and classic Douro white salty, green olive, notes and a touch of chalkiness on the finish. A wine to match generously proportioned traditional dishes, with pungent olive oil and garlic. From a cooler year, the 2014 is less concentrated but shows the same saltiness together with resin/pine needle notes. Retains its freshness well. Mafarrico Tinto 2015 was just bottled – because, he says, “I know very well that style…I wait for the style….it’s when it doesn’t have lots of fruit.” Which explains why it is the Baixo Corgo equivalent of Vale de Pios, meaning it has a more traditional flavour profile (rounder, plummier, with esteva) but, coming from a cooler region, is fresher with more textural, cool, sooty tannins. Well done. With bottle age, a 2012 example shows more sucrosity, spice (liquorice/anise) and esteva. Mafarrico Maquia Tinto 2014, which was first made in 2008, is made at Niepoort from grapes at the top of an old field blend vineyard (400m) just south of Quinta da Gaivosa in the Santa Marta valley. Picked earlier and from altitude, it is a lighter hue than the other wines and, with its red fruits and freshness, put me in mind of Lavradores de Feitoria Meruge, though it is not so ‘polished’ with new oak. Still, this is an elegant red with crunchy, pithy, bright red fruits and fine, powdery tannins. It was fermented in stainless steel then aged in 550l barrels; 12.5% abv. Bottled since I last tasted it the previous year, Mafarrico A Minha Vinha 2015 is made with consultancy from Jorge Moreira and I see his hand in this wine. Taking top French regions as my stylistic indicator, whilst Niepoort tends towards Burgundy (less extracted, more red fruits), Moreira’s style is more Bordeaux (elegant still, but darker, spicier fruits). Aged in 30% new French oak barriques, this is a dark fruited but precise, lifted red with that cool sootiness I found in Mafarrico Tinto, crushed coriander seed spice, fine but plentiful powdery tannins and a long, elegant finish. Very persistent and fresh. As if to come a full circle, my producer visits concluded with Luis Seabra – another producer who makes wines in the Douro and Vinho Verde, like Márcio Lopes (and, hot off the press, has just rented a Dão vineyard in Vila Nova de Tázem). Over lunch, we tasted verticals of wines from both regions (Seabra made his first wines in 2013), then visited the winery which he is currently renting to taste barrel samples. As you would expect from a former Niepoort winemaker, his range is sophisticated, made with freshness and longevity in mind. Niepoort obviously gave him excellent exposure to the Douro and, prior to that, Seabra worked for the government in Vinho Verde. His range is imported into the UK by Berkmann. You can read a bit more background about Seabra’s projects in this early post here I wrote for Blend. 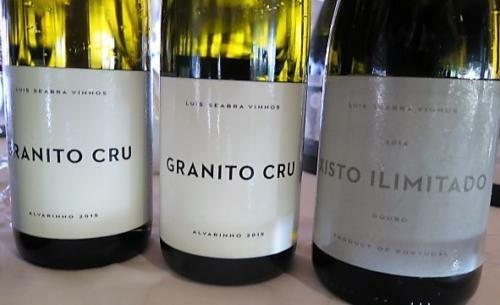 Luis Seabra Granito Cru Alvarinho 2103/2015 (Monção-Melgaço, Vinho Verde) comes from three vine plots in the parish of Paderne, Melgaço. This is not made in the classic modern, unoaked style. 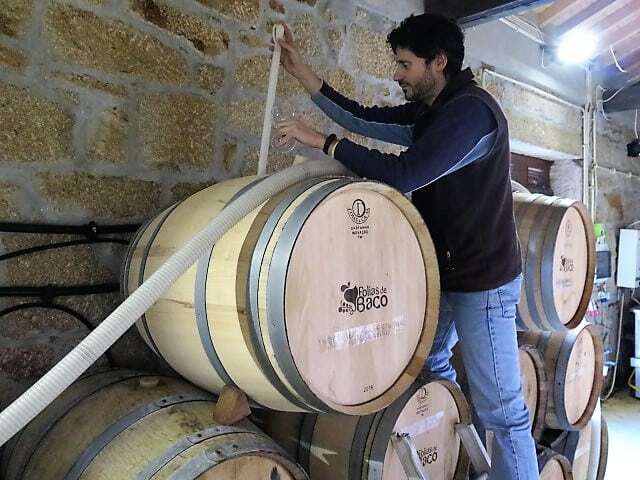 Seabra naturally ferments then ages the Alvarinho on lees (no batonnage) in 1000 and 2000l Eastern Europe oak casks; it also undergoes malolactic fermentation. The 2013 is showing well, with very good intensity to its silky white peach and nutty oak/leesy notes (Seabra notes that the 2013 featured new oak, simply because the cask was new). The 2015 currently looks and smells a little oxidative (the winemaker notes so did the 2013 at the same stage, but says they lose that perception). In the mouth, the fruit – greengage, green pineapple with fennel nuances – is firm and very persistent, with good intensity and lively drive. I like the palate very much. The bolder ’16, conversely, is exuberant in its expression of fruit (I have found this contrast between these vintages in previous top Alvarinhos), with honeysuckle, peach and apricot. More body if not quite the same drive as ’15 (Seabra notes that the fruit was harvested with high malic acid, which then dropped out significantly on malo). Great flight, showing the vintages well. Luis Seabra Xisto Ilimitado White 2016 (Douro) – 12.5% abv – comes from several plots of small 35-60 year old vines on mica schist soils at 500-600m in Meda, the Douro Superior. The 2016 is a blend of Rabigato 50%, Códega 20 %, Gouveio 15% Viosinho, 10% others and was aged for 12 months in 228, 400 and 500 litre used barrels, 10% in stainless steel vats. It shows good fruit depth (2016 strikes again) and freshness, with a subtle underlying minerality, making for an unintimidating entry level new wave white. 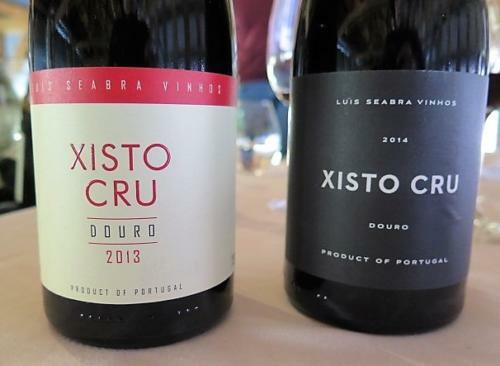 Luis Seabra Xisto Cru 2014 and 2013 (Douro) are quite the contrast. This cuvee is an old vine Rabigato-led blend with Códega, Gouveio, Viosinho e Donzelinho Branco from a vineyard at 650-700 m. It is naturally fermented and aged on lees without batonnage for 12 months in 228l used French oak barriques. The ’14 seemed a little rubbery and closed (reduced? ), with underlying nutty nuances and zippy acidity. The ’13, on the other hand, was very expressive and impressive with lingering orange peel and marzipan notes and a firm, mineral acid underpinning. 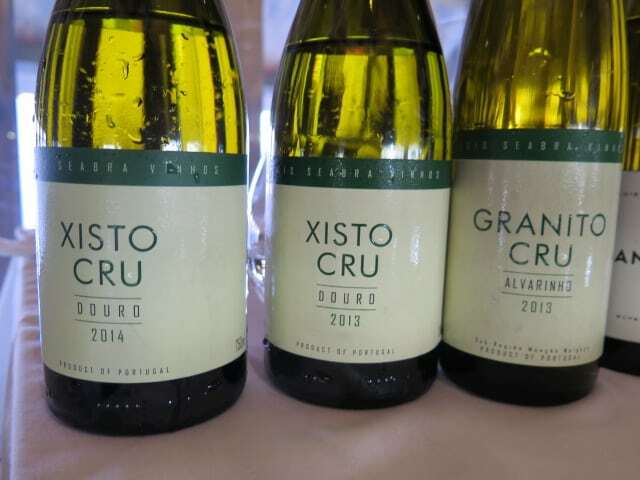 I tasted Luis Seabra Vinhos Xisto Cru 2015 (13%) at home over two days in December for an upcoming (June edition) Decanter Experts’ Choice on Portuguese white wines. I found the oak quite pronounced on both days, with smoky lime oil and cedar. However, looking beyond that, this wine has restraint and lots of nuance, with silky but muscular white peach and poached pear, steelier grapefruit, minerals (schist and creamy/saline oyster) and nutty lees/oak going through. It’s an accomplished, ambitious wine which will benefit from a couple of years in bottle for the oak to marry. 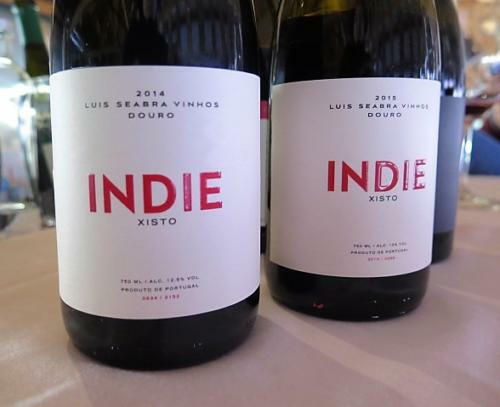 Luis Seabra Xisto Ilimitado Red 2015 (Wine of Portugal) was sourced from two 35-60 year old Cima Corgo vineyards in Cotas and Ervedosa do Douro, located between 400-550m. Seabra mixes up the winemaking too with, in 2015, 30% whole bunch fermented in lagares, 70% in stainless steel (with 30% whole bunch). The blend components were aged for 12 months in used French oak barrels. 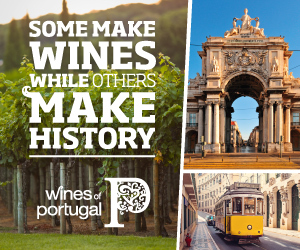 Ilimitado Red 2015 was not approved by the IVDP certification board, hence the Wine of Portugal designation. Though attractively floral scented and lifted, the nose is also a little clenched/compressed, with a touch of volatile acidity? But I like its sour black cherry juicy palate, with its gentle schistous backdrop. 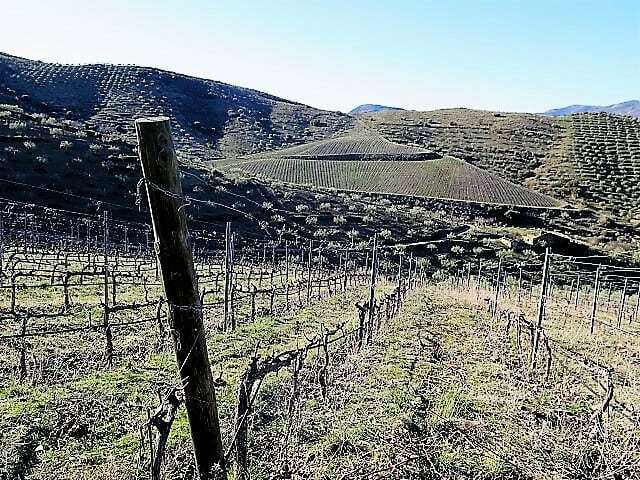 Luis Seabra Indie 2015 (Douro) is from a single c. 70 year old vineyard at 580m in Alijó, planted on blue schist soil (hence much less clay); the grapes included Tinta Roriz, Touriga Franca, Tinta Amarela, Rufete, Tinta Barroca and others. It is a deeper hue than Ilimitado, with a very fresh, but succulent, fleshy palate with very fine tannins and lovely palate-pervasive, inky florals. Persistent, with delicious fluidity/juice. 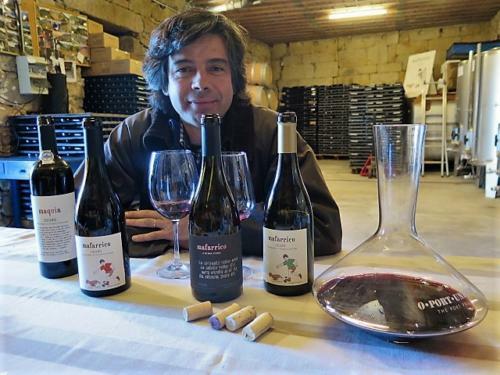 The grapes were foot-trodden (100% whole bunch) in granite lagares and naturally fermented, with very little extraction (total maceration of 10 days where, says Seabra, “using whole bunch is useful, because it forces me not to extract too much).” Nothing was added to the wine but sulphur. It was aged for 22 months in French oak barriques. 13% abv. Luis Seabra Xisto Cru Red 2014, 2015 (Douro) were sourced from two c. 80 year old Cima Corgo vineyards in Covas and Ervedosa do Douro, located between 400-570m. It was interesting to taste 2017 barrel samples from these vineyards. Reminding me of a Columella barrel tasting with Eben Sadie some years ago, Seabra described the Covas – with its higher clay content yellow schist and west-facing aspect – as giving the flesh to the blend. North-facing Ervedosa, on the other hand, brings more nervosity- floral lift, minerality and graphite tannins. Key varieties include Rufete, Touriga Franca, Tinta Carvalha, Alicante Bouchet, Donzelinho Tinto, Malvazia Preta and others. The two vineyards were naturally fermented separately in 3500l open old wood port wine vats, both with 100% whole bunch; nothing was added to the wine but sulphur. The wines spent a total of 34 days on skins. After pressing, the Covas wine aged in 350l barrels and the Ervedosa wine in 228l barrels for 22 months on lees. While Seabra preferred the 2014, I was seduced by the delicious florals and fruit of the 15 and its fine powdery pull of tannins. This vintage has a gossamer quality – as if one was looking at the wine through a gauze cloth, so the fruit has a translucency about it, which makes for an elegance, fluidity and persistence which I really enjoy. Seabra likes the more savoury quality of the 14 and, though I liked its spice, I just found it a little too compressed and edgily acetic for my taste. Sadly, the 2013 was corked. In the winery, a barrel sample of Xisto Cru White 2016 showed good fruit on the nose and an energetic, taut, very fresh, lemony palate. An example from ’17 was quite the contrast – very still, with nutty and floral notes to its quince fruit. More about palate weight than race and pace. Very complete already. 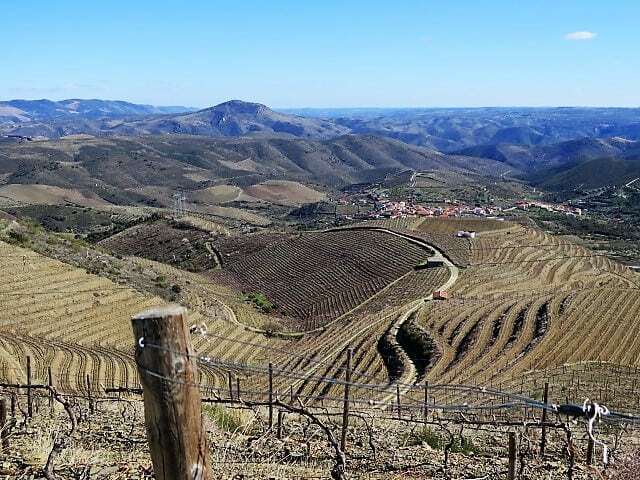 Seabra reckons that the quality of Xisto Ilimitado Red 2016 goes up a notch this year on account of a higher old vine component from the Baixo Corgo. 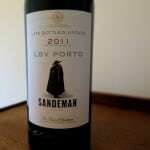 It has lovely intensity and freshness to its pippy, sappy fruit. I love that on/off dynamic from a touch of astringency (pippiness) and good juiciness (sappy) going through. Wet cement tannins (or lees influence?) on the finish emphasise the coolness. Indie 2016 is a much cooler customer. Subdued, but dense and tight, with a freshness. Incidentally, barrels samples of Castelão point to this variety’s renaissance in lighter red mold. In my third post about Simplesmente Vinho 2018, I’ll review my highlights from two days of tasting at the fair in Oporto.